The place has everything you need for a stay of several days - a lot of space, a fridge, a washing machine, a stove and a great airconditioning system, all the utensils and dishes you might need to cook yourself and dine at the place. It's very clean and modern. The employees at the office are a team of very nice helpful young people who speak very well English and make every detail of your stay clear. It's located only a minute (walking distance) from La Sagrada Familia and there are plenty of shops and restaurants around. Great location. A generally comfortable apartment . Very clean. 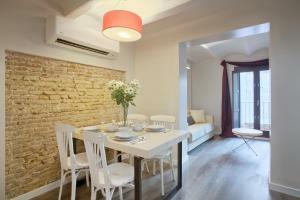 Location is amazing, really close to Sagrada Familia and transports. Clean, plenty of towels. Lovely staff, Manuel very nice and available to help with anything! The location was perfect, so was apartment. 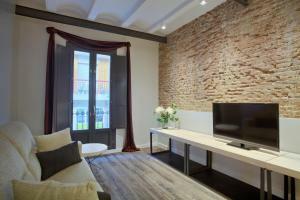 I would recommend this apartment to anyone who wants to go to Barcelona. If and when we return to Barcelona I will request for us to stay at the same apartment. We arrived just after a festival in Spain and the beds were extra comfy which allowed us to rest after a few days or uncomfortable sleep. Apartment had everything that was needed. The location is excellent! Very close to Sagrada Familia. There is a Carrefour Express nearby. I like the location. It is just 200 meters away from the train station and the La Sagrada Familia church. Very convenient in terms of getting around since it is in the center of the attractions location. A localizacao era muito facil e o alojamento limpo e confortável. 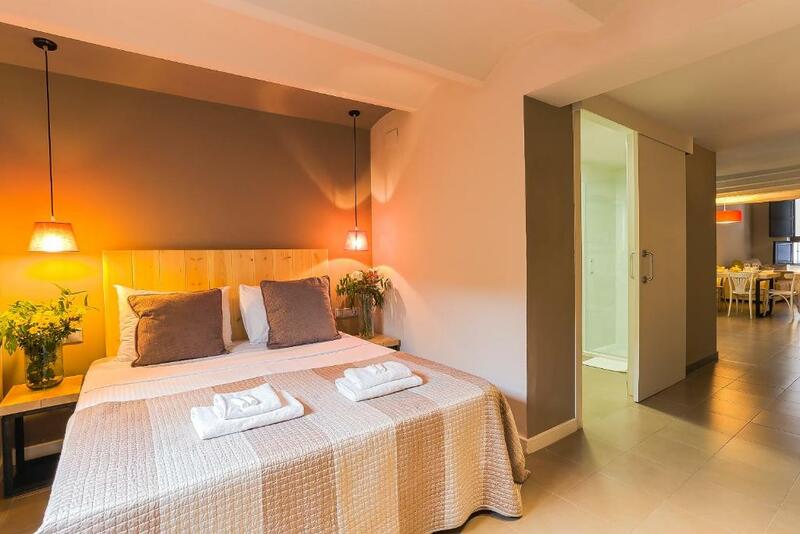 Lock in a great price for SSA Sagrada Familia – rated 8.2 by recent guests! 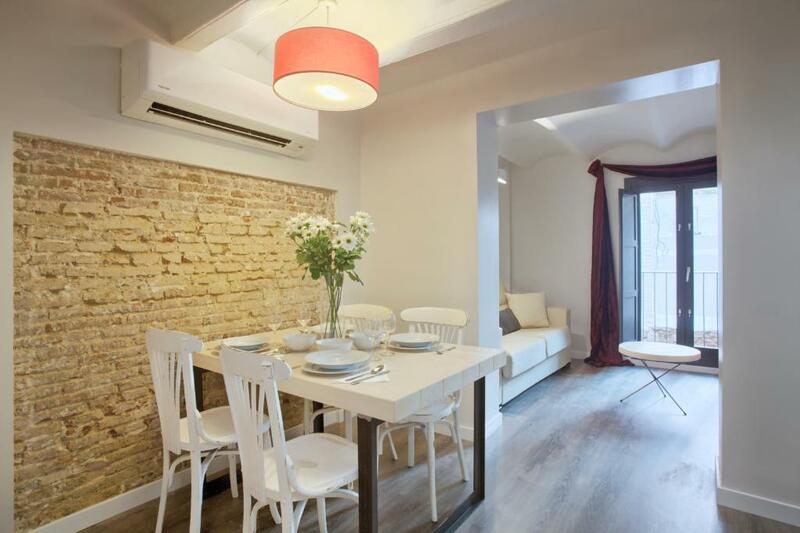 Located just 550 feet from the Sagrada Familia in Barcelona, SSA Sagrada Familia offers air-conditioned apartments with free WiFi. The Sagrada Familia Metro Station is 2 minutes’ walk from SSA Sagrada Familia, and Monumental Bullring is 2,650 feet away. Gaudi’s La Pedrera and Casa Batllo are both within a 15-minute metro ride. Plaza Catalunya is 3 stops away by metro, where you will also find the famous Las Ramblas. Barcelona El Prat Airport is 9.1 mi from the property. 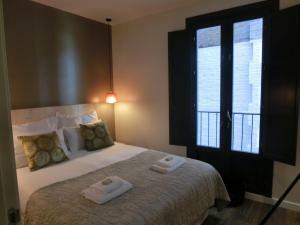 When would you like to stay at SSA Sagrada Familia? 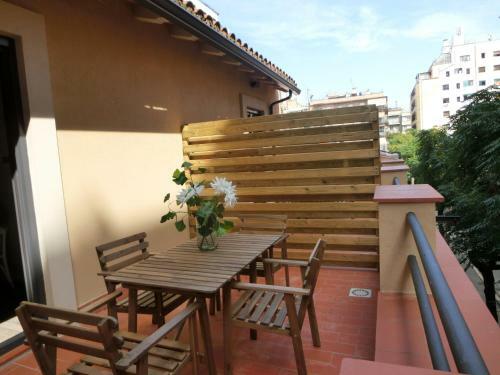 This air-conditioned apartment features a private terrace with views of the city. Each bedroom includes a double bed and a wardrobe. Free WiFi is available. There is 1 bathroom with a shower and hairdryer, and the well-equipped kitchen comes with an oven, hob, microwave, electric kettle and kitchenware. A washing machine is also available. The living area has a sofa, flat-screen TV, and a large floor-to-ceiling window. You will also find a dining table. Bed linen and towels are provided. This air-conditioned apartment features free WiFi. 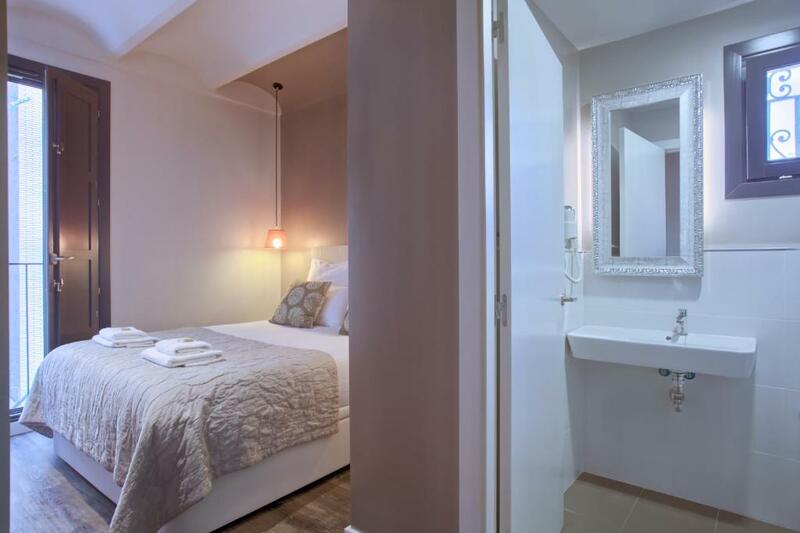 Each bedroom includes a double bed and a wardrobe. There is 1 bathroom with a shower and hairdryer, and the well-equipped kitchen comes with an oven, hob, microwave, electric kettle and kitchenware. A washing machine is also available. This air-conditioned apartment features free WiFi. There is a double bedroom with a wardrobe, and 1 bathroom with a shower and hairdryer. 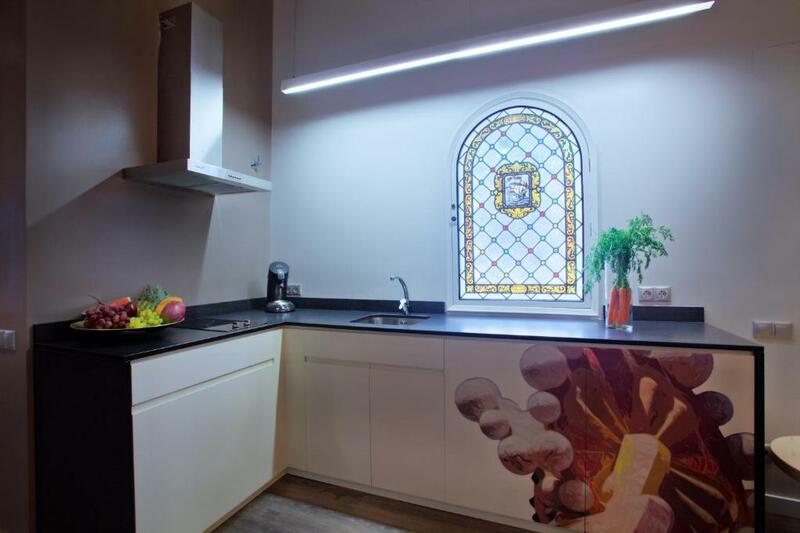 The well-equipped kitchen comes with an oven, hob, microwave, electric kettle and kitchenware. A washing machine is also available. The living area has a sofa, flat-screen TV, and a large floor-to-ceiling window. You will also find a dining table. Bed linen and towels are provided. 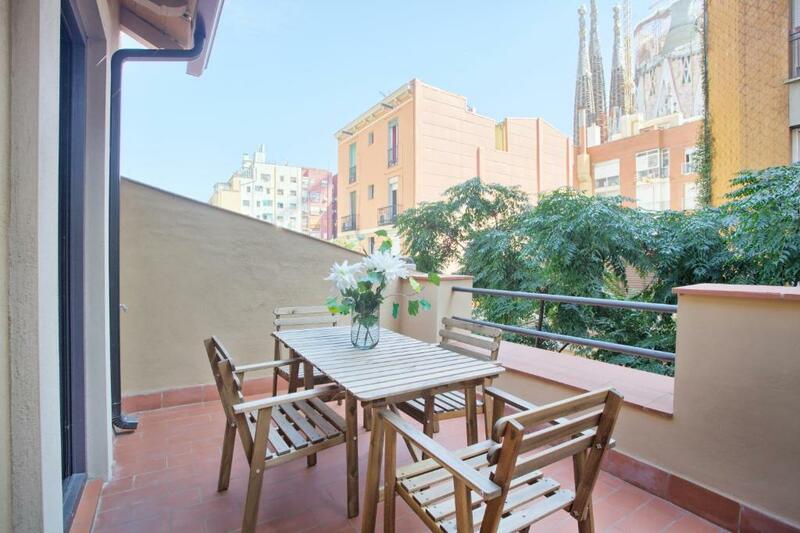 Next to the world famous Sagrada Familia you will find the modern and spacious apartments. Short Stay Group offers a homely welcome to corporate and leisure travelers looking for an alternative stay in the vibrant centre of Barcelona. The residential area of the Eixample district is a living museum of Modernist Architecture. The district is perfect for those who want an authentic experience. It offers a true feel of life in Barcelona with major places of interest that are easily accessible. House Rules SSA Sagrada Familia takes special requests – add in the next step! SSA Sagrada Familia accepts these cards and reserves the right to temporarily hold an amount prior to arrival. If you expect to arrive after the office is closed at 20:00, you must call during the property's office hours to let them know your arrival time. This way they will be able to organize your check in at the apartment. Late check-in will have EUR 40 extra charge. Check-in after 01:30 is not possible. Please note that a baby cot has a surcharge of EUR 45. Please note that check-in and key collection take place at: Carrer Ferran, 11 - Mezzanine Floor, Barcelona 08002. Please inform SSA Sagrada Familia of your expected arrival time in advance. You can use the Special Requests box when booking, or contact the property directly using the contact details in your confirmation. The check in process is not ideal, distance from the front office to apartments is substantial. Once checked in, you have to take transportation, specially with luggage and kids. I do not recall reading the check in process as I did the booking, recommend highlighting it in the advertisement. In the apartment the sofa bed was broken and unstable, main door lock had bolts not properly tighten, and kitchen door hinges were not properly secured. Details the owner should fix right away to make a perfect stay. Lastly, and unfortunately other residents do not abide by the “rules” with loud noises and music into the night and early morning. Location was perfect; apartment looks modern. There was only one window with no view. The apartment was dark. Noisy at night from other residents. Toilet at times faulty but phone call to office resulted in someone coming out to fix it. The office where you pick up the keys is quite far from the place (40 minutes walking), so I'd recommend taking a subway. It's a pity the view from the windows is blocked by the near-standing buildings, but you can see La Sagrada Familia from an angle. Wifi was extremely bad. We couldn’t even send messages from whatsapp! There was moisture and dampness all over the rooms. I even saw a cockroach! !Ceiling was too low . It was hard to breathe if you close the window. and there was only one small window and it was impossible to wentilate the room. I don’t recommend you to stay in this place , in such a good and lovely city like Barcelona. Nothing, I enjoyed everything about this apartment. I have no complaints at all about the apartment or the area it was situated in. Sofa is bad and too noisy and already kaput. my sleep was too bad and not a Relaxing vacation. WiFi speed is super slow. Not usable at all! The check in and collection of keys is quite troublesome. In fact we have to pay 40 Euro for late check in (we arrived at 8.30pm). Anyhow their staffs are very helpful and can speak English very well.